Abstract: The Biological potency assays are widely used in biopharmaceutical drug development and commercialization as indicators of biological activity, stability, and quality of biological products. Precision and accuracy in determining the potency is very important in biopharmaceutical drug testing and lot release. Bioassays in general are tedious, involve many time consuming steps and thus increases the possibility of manual errors and reduces the through-put of sample testing. During the past several years, the United States Pharmacopeia Convention has focused on public standards to modernize and expand the bioassay requirements in the United States Pharmacopeia (USP). In order to improve the through-put and eliminate the tedium of bioassays, automation is highly desired. Use of robotic liquid handling systems facilitates the automation of multiple steps in biological and analytical methods while maintaining great precision and accuracy. We have developed an automation module in Hamilton robotic system that is adaptable to several bioassays. The automation module is validated for a cell based luciferase reporter gene assay and compared its equivalence to the manually performed luciferase reporter gene assay. Our results demonstrate that both manual and automation methods pass the qualification criteria for repeatability, accuracy, linearity, and intermediate precision, while automation shows less overall variability for these parameters. 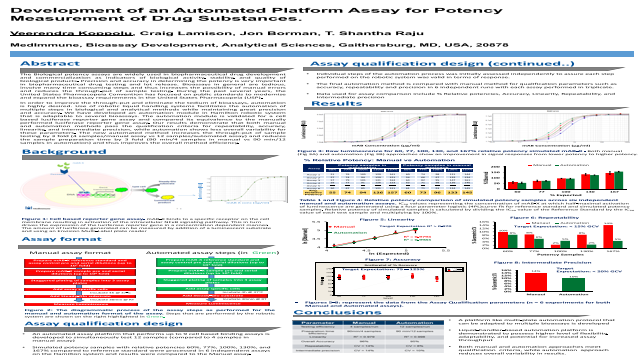 The new automated method increases the through-put of sample testing by 3 fold (4 samples/manual assay vs 12 samples/automated assay) and reduces the sample preparation time by 3 fold (90 min/4 samples in manual vs 90 min/12 samples in automation) and thus improves the overall method efficiency.